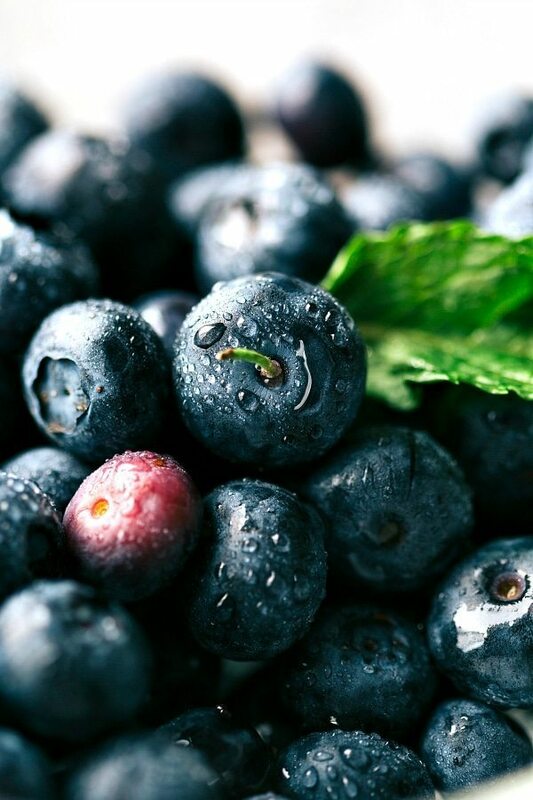 10 easy, on-the-go, breakfast or snack ideas of how to top your yogurt! The husband and I finished our half marathon this past Saturday and it was honestly the most enjoyable run of my life. The canyon was gorgeous, the weather was perfect, and I felt great throughout the whole run! My sister slept over with our babies since we had to leave at 4 a.m. and when we got home the toddler informed us that we went “outside to run”. His deductive reasoning (or probably more likely the fact that my sister told him that’s what we were doing) is on point. He then followed up the statement with “dadda run fast. mama run slow.” Seriously, what is up with that kid?! He thinks I’m the slowest runner ever. ? Now granted, I’m not breaking records, but still! Haha. Anyways I feel like I’ve kind of been holding out on you guys because I’ve literally had a bowl of vanilla Greek yogurt for 90% of my breakfasts (and about 50% of my snacks) this past month while I’ve been upping my mileage and getting ready for the race. Obviously the exact same bowl of yogurt gets a little boring so I’ve rounded up a quick overview of the favorite variations we’ve been eating. One thing that I won’t put with all of these variations is I pretty much always have vanilla flavored Greek yogurt. It’s my favorite and (in my opinion) a whole lot better than plain Greek yogurt! “Chunky Monkey” yogurt bowl: add chopped walnuts, dark chocolate chips, and sliced bananas to your yogurt. 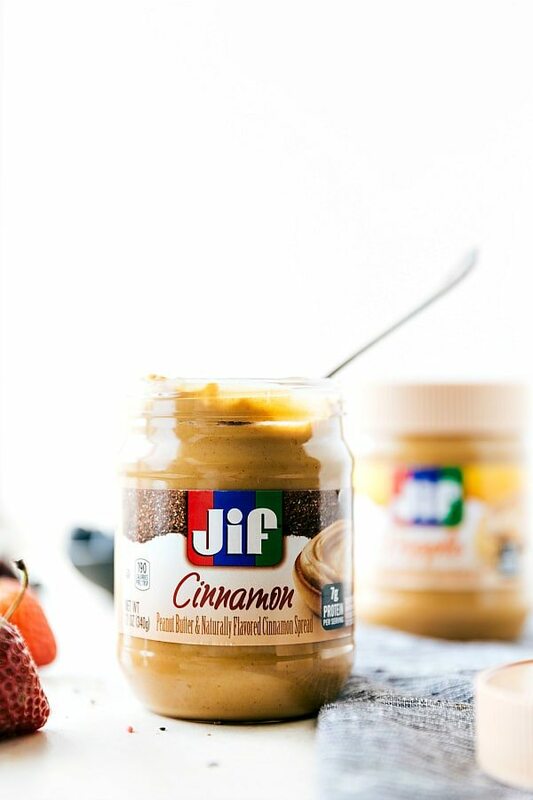 Warm up 1-2 tablespoons Jif Spreads Cinnamon Peanut Butter and drizzle it all over. The Jif Spreads Cinnamon Peanut Butter is a recently discovered-to-me product and I’m totally obsessed. It’s amazing on so many things — yogurt (obviously), waffles, toast, you name it! 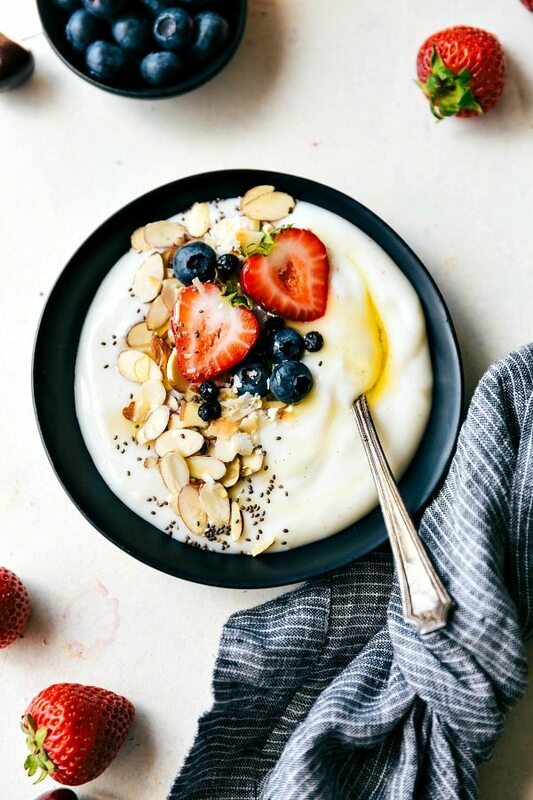 Honey Vanilla-Almond Berry yogurt bowl: add a few fresh berries, a handful of sliced almonds, some chia seeds, and some dried blueberries to your vanilla-flavored yogurt. Drizzle 1 tablespoon of honey or agave nectar over it all. Fresh Fruit yogurt bowl: strawberries, raspberries, blackberries, blueberries, banana, mango, peaches, pears, apricots, etc. Just about any fresh fruit is delicious in a yogurt bowl! 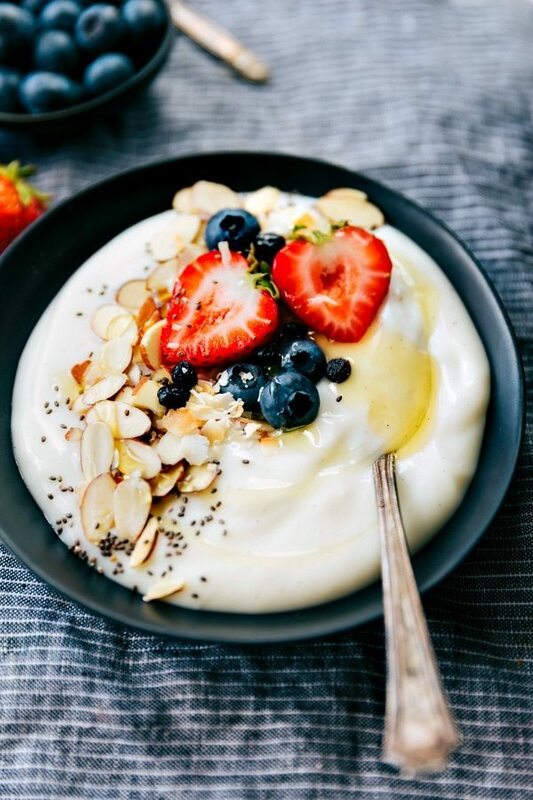 Top the yogurt with a handful of fruit, a tablespoon of agave nectar, and some chia seeds. Apple Cinnamon yogurt bowl: add a chopped apple, light sprinkle of cinnamon, and chopped pecans to your yogurt. Warm up 1-2 tablespoons Jif Maple Peanut Butter and drizzle it all over. 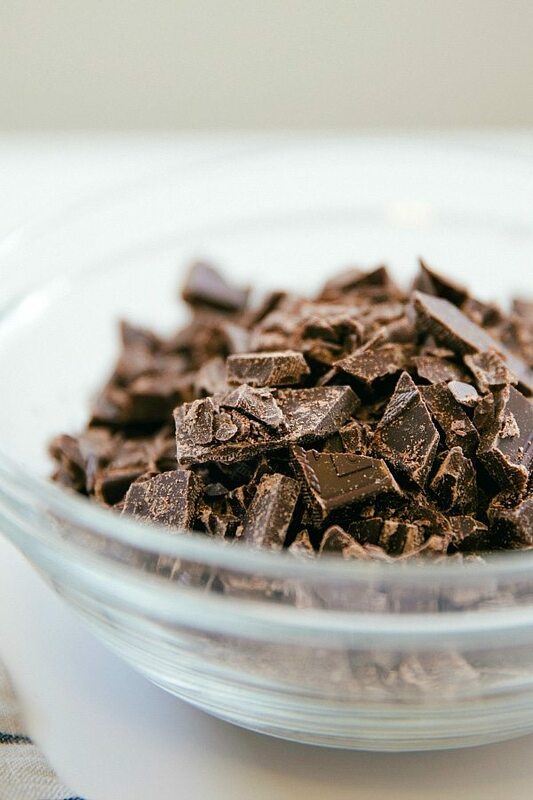 Peanut Butter Cup yogurt bowl: add dark chocolate chips to your yogurt. Warm up 1-2 tablespoons Jif Spreads Maple Peanut Butter and drizzle it all over. Can you tell I’m a little peanut butter happy with topping yogurt with all the peanut butters?! Creamy Coconut yogurt bowl: add 2 tablespoons full fat coconut milk, 2 tablespoons toasted coconut, and 1 tablespoon honey to your yogurt. Top with fresh berries. Honey-Almond Granola yogurt bowl: add a heaping handful of this delicious granola to your yogurt. Top with some fresh raspberries. Chocolate Crunch yogurt bowl: top your yogurt with chopped hazelnuts and chopped dark chocolate. Enjoy a Jif Hazelnut Chocolate Flavored peanut butter bar on the side of your yogurt. (<–some of the best tasting granola bars ever!) These bars have also been a staple as of late. They make a great time-saving on-the-go snack. I don’t have kiddos in school yet, but it already feels like I’m constantly driving them around for play-dates or to go to the park now that it’s warm outside. 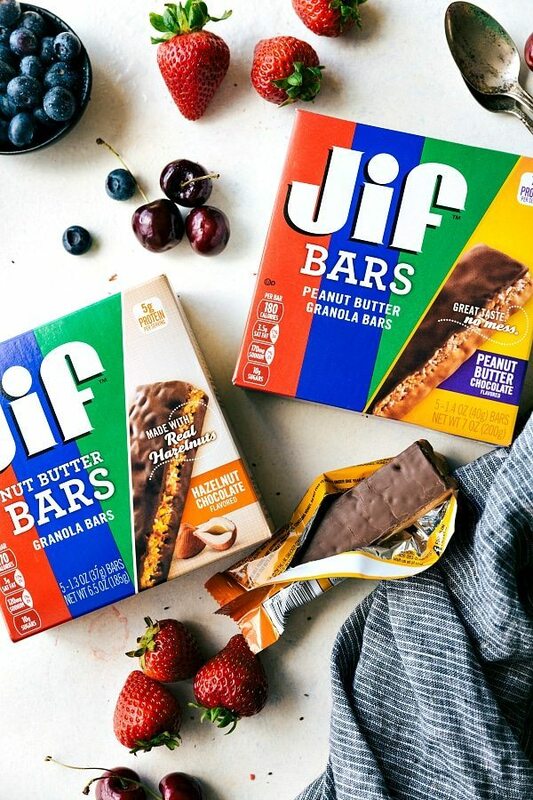 These Jif bars have been a lifesaver to grab quickly and take on the go. I love them and so does the toddler; not only for their amazing flavor but also because they are so filling. Candied Nut Crunch yogurt bowl: add these candied nuts and some fresh berries to your yogurt. Double Chocolate yogurt bowl: add some of this amazing chocolate granola, some dark chocolate chunks, and some chia seeds. And that’s a wrap! ?? I’m ALWAYS looking for ways to liven up my bowl of yogurt in the morning and something tells me I’ll be set for awhile after seeing all these AMAZING ideas! That chunky monkey yogurt bowl has my name written all over it!! Lots of great ideas of things to mix together.